Nine months of mandatory conservation measures in California have saved enough water to supply nearly six million residents for a year, and officials in the parched Golden State are urging people to remain diligent as drier and hotter days loom. 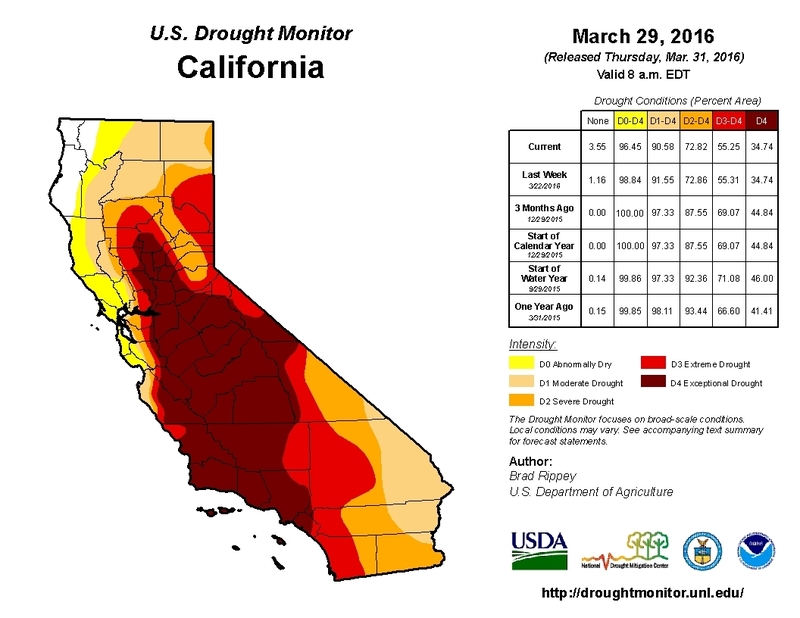 About 90 percent of Californians are living under drought conditions, according to the latest report from the US Drought Monitor. But some residents in water-rich counties in the north are calling for the state to relax restrictions. In Placer County, for example, the water agency sent a letter to the State Water Resources Control Board last month requesting it rescind emergency drought regulations in the region. Ross Branch, public affairs manager for the Placer County Water Agency, said reservoirs in the area are over capacity. The agency has enough water to supply customers for the rest of year, he said, and likely through 2017. "How can you continue to ask customers to conserve when the reservoirs are overflowing and it's the best snow we've had in four years?" Branch said. "There's clearly not a drought in our region." Felicia Marcus, chair of the State Water Resources Control Board, said during a board meeting on Tuesday that she's sensitive to the fact that water resources in the state are complex and checkered. She invited suggestions and ideas from communities around California leading up to another meeting next month when board members will consider modifications to an emergency regulation that extended restrictions on urban water use in February. "My mind's totally open on how we move forward," she said. Kathy Frevert, a conservation specialist for the board, applauded California residents for stepping up to the call to conserve water and said some conservation requirements will be eased thanks to the success of those cutbacks. But she also cautioned that the drought isn't over, and Californians need to remember that with a warm summer ahead. Mandatory conservation started in June 2015. By February, 23.9 percent of water compared to the same nine months in 2013 had been saved, shy of Gov. Jerry Brown's 25 percent water conservation target. That's nearly 1.9 million acre-feet of water, or enough to supply the number of residents in San Diego, Riverside, and Tulane counties for one year — 15 percent of the state's population. Mandatory reductions will continue across the state through October unless the state revises regulations before then. Heather Cooley, water program director at the Pacific Institute, a water policy think tank based in Oakland, thinks the board and other policymakers should capitalize on the momentum that's led to water savings over the past year. Rather than focusing on what restrictions California can afford to scrap after a wet March, she said, policymakers should concentrate on how to embed long-term sustainability in the system. Cooley pointed to Australia as a model, where after a decade of drought the country made structural and behavioral changes to how it uses water. "I think what we need to be asking is how do we lock in these savings," she said. "How do we build on the ... success that we've had and try to promote conservation and efficiency as a way of life in California?" Back in Placer County, Branch thinks residents there are mindful that there could be dry years ahead. The community has always used water wisely, he said, and people there are willing to do their part — when the conditions call for it.